These long-held misconceptions are carried down from industry veterans to newcomers. The problem is that while these overarching beliefs may have once held a kernel of truth, construction is changing. In the 1960s, contractors could make 10 to 15 percent profit margins. Since the 1980s, that margin has dropped considerably. But contractors—and their beliefs—haven’t adapted. 1| Growth is always good. The business model for construction has always been based on growth. You’ve probably heard the mantra if you’re not growing, you’re going backward. The idea is to start an enterprise, put a lot of work into it, build it to critical mass and then grow it. Because the rebounds from prior economic downturns were so robust, it validated the thought that growth is always good: Companies lost money, but they got it back. Not this time. The industry put in place 30 percent less in 2013 than in 2007. And as a whole, it’s giving away work and not profiting. 2 | The construction industry isn’t necessarily cyclical. This notion came into place because of the exceptional growth and prosperity from World War II through the 1980s. Times were so good—and recoveries from recessions so robust—that people failed to acknowledge the cyclical nature of the economy. However, the construction industry follows the U.S. economy, which has always been cyclical. Construction lags behind the general economy, either turning downward or picking up momentum approximately 12 to 18 months later. But it’s most certainly locked into the U.S. economy. Cycles are the norm in construction, and the time to prepare for the next downturn is now. 3 | Down times are bad news, but a natural part of the industry. Construction companies can’t accept downturns as minor blips in business and continue to function as normal. In bad years, many companies give back in losses what they gained during good years. 4 | Overhead is a symbol of success. One of the problems with overhead is that it increases the capacity of a company by adding more employees, office space, equipment and so on. Increased capacity correlates to growth, which takes us back to the first industry misconception. Contractors are reluctant to downsize because it means giving up much sought after growth. 5 | Cutting overhead is an admission of failure. 6 | Unprofitable work is just part of the business. It’s an accepted belief that there are losing jobs in every company’s book of business. Some construction contractors hope to make money on nine jobs and lose money on one, but not so much that it hurts the company. 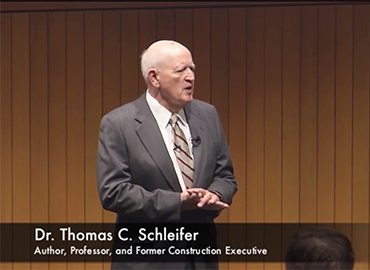 Dr. Thomas C. Schleifer, nationally renowned “turn around” expert, who has managed the resolution or salvage of hundreds of distressed construction enterprises and is the author of Construction Contractors’ Survival Guide, a book acclaimed by thousands of contractors and used as a text in numerous university graduate and undergraduate courses. Dr. Schleifer is known for his insightful industry analyses and remarkably accurate market projections and has studied the economic dynamics and impacts of prior market rebounds. Holds bachelor’s, master’s and doctorate degrees in construction management. Is past president of the largest international consultancy firm serving the contract surety industry. Authored the book Construction Contractors’ Survival Guide and Managing the Profitable Construction Business. Serves as research professor at Arizona State University’s Del E. Webb School of Construction. Frequently lectures on construction and business management at universities, professional organizations and trade associations.